Hello, my lovely book-ish people! I am happy to say that I have returned from the dark and gloomy land of midterms and back into happy Blogger-land! And seeing as I have no intention of going anywhere further than the kitchen and the mailbox, you'll be hearing a lot from me! While it seems like I didn't do much besides eatsleepstudy, rinse and repeat times seven, there were a few moments of near-breakdown that were thankfully staved off at the last moment with a few stolen snatches of reading time. The book was Darkness Becomes Her by Kelly Keaton, and I'll be honest with you guys. I wasn't going to read it at first. I read the description, idly flipped through the pages, mulled it over, and put it in my to-donate stack. But then, somewhere around Tuesday, all that communist propaganda studying was really getting to my head, and I picked it up. And here's the part of my story where I wish I could enable sound effects, because the sound of me being sucked into the book goes something like, whoooooooooooosh! So, then my week became eatsleepstudy, only the study part was motivated by chapters of Darkness Becomes Her. Which was both good and bad depending on how you look at it. Good because I escaped this week with my sanity mostly intact, and bad because the sanity was threatened by some very late nights of prolonged studying and early mornings lacking coffee. So, the moral of this story? 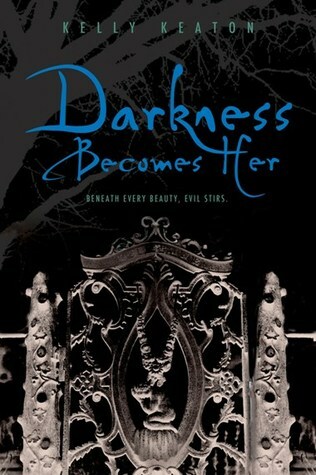 Darkness Becomes Her is awesome! It's an innovative blending of genres with a strong heroine and awesome narrative. There's a little bit of dystopia, some good supernatural elements, and even some mythic aspects, and that's all I'm saying so as not to give anything away. But, pick up this book--it's so unique, I guarantee you won't find anything else like it! In the meantime, I'm going to go catch up on this blogging thing with reviews of Abandon by Meg Cabot (totally awesome! ), Desires of the Dead by Kimberly Derting (nice and creepy! ), The Nature of Jade by Deb Caletti (so sweet and moving! ), and The Summer of Firsts and Lasts by Terra Elan McVoy (funny and bittersweet!). OMG! I felt the same way! The book summary did not impress me. I started reading it and was meh at first. Then I got to the second chapter and got sucked in. I ended up loving the book so much!! I've been recommending it to all my friends. Seriously, the book summary did not do it justice. It is an amazing book. Yes! The summary doesn't even do the book justice..it's so much more. I love her title. I've been great at titles, so I'm always jealous when one like this comes along. I will def have to pick this book up now! Leaping for Joy for Kate Beasley's debut Gertie's Leap to Greatness! Suzanne Collins is Going on Tour! Steal Alert: Grab Lisa McMann's Latest for $5! Steal Alert: Get The Goose Girl! Counting Down to the Jane Eyre Movie! Cover Talk: What Do You Think?